Carpet Steam Cleaning Brisbane – Terry’s Steam Cleaning – Talk to an expert today! We chat with you about what you would like to see happen. Some customers simply want a few stains gone and for us to clean around the furniture, which we are happy to do. Most customers would like us to clean wall-to-wall, moving most furniture. We vacuum thoroughly throughout, systematically moving from room to room replacing furniture as we go, leaving behind only cleanliness, a pleasant scent and a reasonably dry carpet. The price is usually discussed at this stage to put the customer's mind at rest, with no surprises at the end. We also discuss with you where you would like us to park (on the driveway or in the garage), what rooms will be done first, and roughly how long the clean will take. Once you are completely relaxed about the procedure, we start working on your carpets carefully with particular attention to detail. Most furniture is moved (depending on weight, size and contents), sliders are put under legs of some heavy pieces if they are required to be moved, display units, book cases and sideboards are moved only if they have been emptied. Flat-to-the-floor furniture must stay off the damp carpet until completely dry (or not moved in the first place) or only vacuumed beneath. Moving furniture makes the clean look more uniform across the room when dry. We vaccum using a power-head style vacuum cleaner. This step is crucial in the cleaning process because once the carpet is damp with shampoo, hair and fluff is almost impossible to remove without physically picking it off the carpet surface. We often will fill a vacuum cleaner bag when vacuuming a full house. Funny Fact: When Terry worked on his own, ladies would often comment that they have never seen a man vacuum before! Stains are treated during the cleaning process. Knowing what the stain is is important information, but most customers don't know who did it or how long ago it appeared. Some stains are treated by the customer before we arrive which, unfortunately, changes them chemically. These we call creations and are difficult to remove. Nevertheless, all stains are treated with the best knowledge we have to hand and more often than not are removed fully or at least made significantly paler. Some stains are "as old as the hills" and are permanent. We prefer to 'steam clean' carpet, it's a hot-water-extraction process which has been around since the 1960's in Australia and is widely considered to be the favoured carpet cleaning process amongst carpet cleaners world-wide. 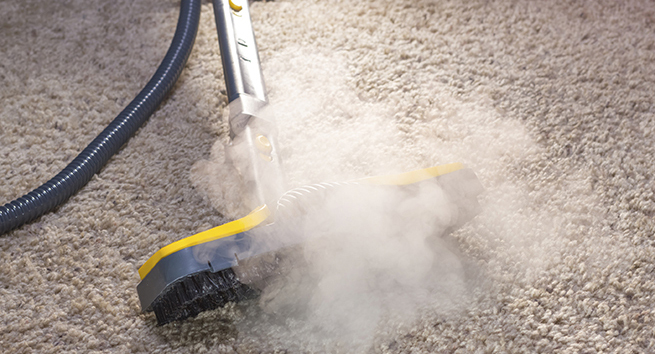 The carpet cleaning procedure is similar to any other cleaning process. We spray the carpet with a quality shampoo and agitate to emulsify soiling. After a few minutes, the shampoo and soiling are rinsed away and extracted in one step, leaving the carpet clean and chemical free. The moisture only goes as deep as the fibre. This process (steam cleaning) is the most difficult type of carpet cleaning to get right but, once mastered, is the most effective. Where necessary, furniture is put back and plastic coasters are placed under any timber or metal legs to prevent staining on carpet as it dries. Depending on the weather (like your clothes drying on the clothes line) it can take from one hour to six hours to dry. Humidity has a big influence on drying times. Fans or air-conditioning can greatly accelerate drying times or we can leave carpet dryers and/or dehumidifiers on wet days if needed (at no further cost). On wet days, before proceeding with the clean, we discuss the anticipated drying time either in person or in a phone call before arrival.